White Eagle Hall is a newly restored and renovated historic theater located in the thriving nightlife scene of Downtown Jersey City, New Jersey. White Eagle Hall presents live music, theatre, comedy, dance, film, family shows as well as other performances while serving food and drinks. In addition, White Eagle Hall is a warm and intimate event space perfect for weddings, receptions, private parties, fundraisers, corporate meetings and other functions. The White Eagle Hall opened in 1910, constructed by polish immigrants and craftsmen under the leadership of Father Peter Boleslaus Kwiatowski, who was driven from his native Poland by Russian occupiers just before the turn of the 20th century. During the depression, but before his death in 1934, Kwiatowski transferred the ownership of White Eagle Hall to St. Anthony’s. The parish managed the venue throughout the 20th century – in addition to church-related and other community activities. 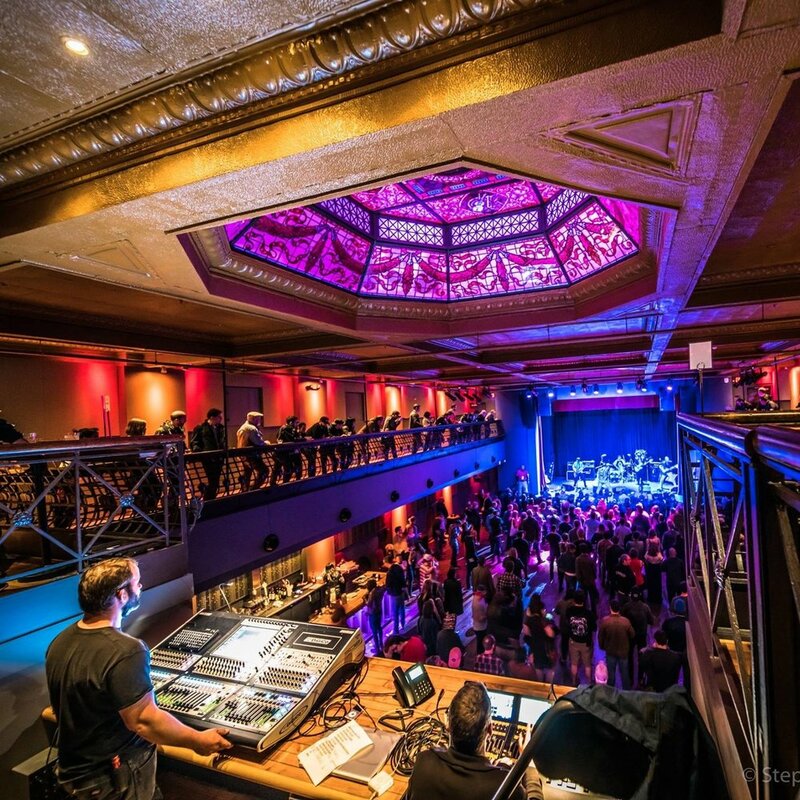 By preserving the historic integrity of the building while enhancing the audience experience with the latest in sound & lighting technology as well as amenities White Eagle Hall is a theater, performance, concert and event venue for the 21st century. Embedded in the White Eagle Hall ceiling are two spectacular, hand-crafted stain-glass skylights – one commemorating Frédéric Chopin, the classical music composer, and the other Marcella Sembrich, an internationally renowned opera star – she sang 11 seasons with New York Metropolitan Opera. Perhaps White Eagle Halls most famous achievement is the facility’s unique contribution to Basketball, the St. Anthony Friars, the basketball team of St. Anthony High School. Bob Hurley – Jersey City native – was the coach of this legendary team. Dozens of students under Hurley’s tutelage earned basketball scholarships to attend colleges and university and went on to play on major league teams. Hurley was the first High School Coach to be inducted into the Basketball Hall of Fame. The original wood basketball floor where the Friars had their famous practice are now used as bar counters and balcony flooring; wood fixtures from Saint Boniface Church (constructed in 1865), can be found in the window frames, bar sides and balcony railings and ledges; Boniface altar fixtures can also be seen in the box office/merchandise area. White Eagle Hall restoration project followed the latest in sustainable building practices, repurposing materials from the original construction by Ben LoPiccolo Development Group, LLC (BLDG) and its restoration was completed in 2016. In 2017, The Jersey City Landmarks Conservancy awarded its 2017 Excellence in Preservation Award for the restoration of White Eagle Hall, as a historic theater and public assembly venue.